Current Situation: In March 2017, the Archdiocese of Denver ended Masses at this vibrant, self-sufficient and devout church. They cited a shortage of priests, various administrative burdens on the pastor and proximity to other parishes. OLV’s usage of priest resources is negligible across the diocese. On any given Sunday, one mass equates to a mere .4% of the total priest resources in Metro Denver. OLV donors have offered to pay for a full-time administrative professional to assist our pastor in his administrative duties, but this offer was declined by the pastor. OLV is about 2 miles from the nearest church which is considered close proximity. However, in Northwest Denver there is a concentration of 11 parishes in a 2 mile area. To be clear: OLV does not wish for any church in this diocese to close. This diocese is extremely stable and not requiring consolidation. OLV has found six priests who gladly agreed to say mass for OLV, but the archbishop will not approve altruistic hearts to be of service. OLV is far more stable and well-managed than most churches in the diocese. OLV has been completely financially self-sufficient for over 70 years. From the hard work of parishioners, this church has accumulated savings of over $200,000. OLV has 397 registered parishioners with weekly attendance consistently over 100 people. OLV’s annual bazaar draws between 2,000-3,000 people per year, and is known for being one of the best bazaars in the City. In the early 1950’s, Archbishop Urban Vehr authorized the construction of the current building which was completed in 1952. This separate parish was placed administratively under Holy Trinity in 1958. While this congregation is predominately English speaking, we know, understand and uphold the cultural contributions that our families have made over several centuries in establishing these United States and the city of Denver. We believe deeply in these faith traditions which illuminate the colorful tapestry of our “universal” Catholic experience. 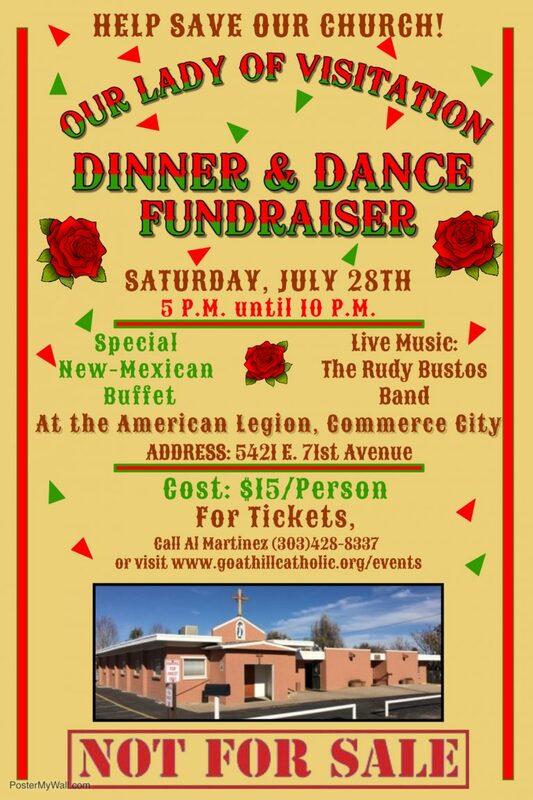 About OLV: Across the entire Archdiocese of Northern Colorado, Our Lady of Visitation Catholic Church (OLV) is the only church established solely by Hispanic Catholics from the Southwest. It has a unique history that cannot be replicated. This quaint church, on a quiet street, is the home of devout Catholics who migrated to Denver from Northern New Mexico and Southern Colorado as early as the 1920’s. The congregation began receiving mass in a place called a Pentitente Morada. The Pentitentes are a lay brotherhood of devout Catholic men (similar to the Knights of Columbus) which originated in Spain as early as the 1500’s. A morada (or ‘dwelling place’) is a meeting house used by the brotherhood. This Penitente Morada (the only one in Northern Colorado) still stands at the end of the same street. In the 1940’s, the congregation secured a donated street car, and, after raffling a hog, secured another street car. Men of the community built the first ‘street car’ chapel in time for Christmas mass in 1944. Purpose of Goat Hill Catholic Society: The area where OLV is located is known as Goat Hill or el alto de la chiva in Spanish. Early Spanish settlers raised goats in these highlands north of Denver. GHCS was founded with the purpose of seeking avenues to reverse this unjust and unnecessary decision to end masses. GHCS will endeavor to prevent the sale or neglect of OLV’s buildings and property.